Ksfx's review (This content has been automatically translated from French)" Some flaws but a great room for improvement for a beginner"
Pads and built-in functions with ITCH really fun to use and is an asset if you want to move to the "live" with Ableton Live (I'm just a beginner so I can not really detail it. With Traktor and the possibility of mapping characters (control 4 decks, decks remix, mapping effects pad style "instant gratification mapping" of DjTechtools it must be really fun. It has already been said, the main flaw of the sound output Twitch is feeble but this defect can be easily compensated (in Traktor, and perhaps soon with Serato DJ) I think the "coupling" with another midi controller with sound card (or K2 xone reloop contour) with an output greater or even routing the output to an external sound card. I think buying a K2 or Reloop Contour (to the external mixer in Traktor) to compensate for this defect when I be producing (for the moment I learned the basics in my "bedrooom"
At the time it was best today with my inclination to scratch I may be taking anything but the opportunities this controller is really not bad. The main concern is that Twitch is in my opinion more suited to experienced users (controllerists in the text) in search of "performance" as new users who want to learn to mix (especially because of the rotary pitch but this is a problem easily solved). Do not hesitate to PM if you have any questions. djlittlenemo's review (This content has been automatically translated from French)" Good but not top"
I mix pro since the last century, and with SSL for some years now. I was looking for a controller for Serato (so Itch) in order to play more easily in tight spaces, or sets with several DJs. Twitch seemed an appropriate solution, the journals on the Internet were all quite positive, especially the pads and mode slicer. In the end, if I Adere to the product philosophy and Itch, which is an excellent software (especially since it allows me to use my library Serato SSL), Twitch is pretty disappointing, for two major flaws: Lack of Sound power output, and the effects shabby. Using the controller is great, the lack of "wheel" does not hurt and can save space. The pads are fabulous. As long as you take the time to prepare your songs (beatgridding, cue points, loops, etc. ), you can really make MIXES live by mixing loops, samples, etc.. But the main defect is that Twitch is powered by the USB port: not only the LEDs are faiblardes (if you play outdoors or during the day, you see nothing), but mostly the sound power output is ridiculous ! ALL of the places where I had to use it (or Drinking large clubs like The Queen), it took me to all the knobs of the mixer (which I have connected my twitch) have to hope sound near the limit tolerated by the place! Even with the Master to build on twitch, the gains can not be pushed under penalty Limit. 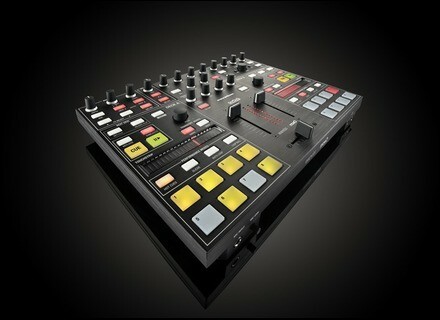 In short, it's a big cat, as most clubs calibrate the mixer to the max to prevent DJs poussdent not too sound. In short, I have only one desire: to sell my twitch - perhaps - the Vestax VCI-380 which combines elements of slide and touch pads. But it is four times more expensive. In short: a nice controller for troubleshooting or small sets in bars or mobile, but to avoid using in Pro. jardindunord's review (This content has been automatically translated from French)" very good controller surface"
Hello, I give you my opinion on the controller Novation TWITCH. I made mix of quality, with the function of several loops and adjustable slicer filter up and down it does wonders, I confess it took me a week before all assimilate all functions, but once this is fun and go there and it is a pleasure to make mixes with TWITCH or simply to change the titles already edited. I advice you, I saw a bit on audio fanzine they were two for sale at about € 450, if you have the money and if you want specific hardware, you should consider buying one, a similar price you can not beat, and needless to give € 1200 to see the pioneering, innovation and a great brand, my studio equipment and dial has 70% of this brand and I do not regret the purchase of any this material. Innovation and value and gains value with age, against the other by mark down very quickly. Here is my review for the brand innovation and equipment TWITCH, with this controller Good mix of exception.